A lawnmower-powered hovercraft that looks like a DeLorean, eh? Robots, 3D printers, Tesla coils spitting indoor lightning coils, stilt walking lessons. Solar-powered electric cars and a hovercraft made to look like a DeLorean. Leather jackets recycled from car seats. Daleks, R2D2, exoskeletons and steampunk pedal cars racing past fire sculptures from the Burning Man festival. Mosaic-covered UFOs, cars covered in dancing lobsters, a human-scale version of the Mousetrap game and a cityscape made out of masking tape. The line to learn to solder is longer than the line for garlic fries and you can go home with a compressed air rocket kit or a Christmas tree ornament in the shape of a caffeine module. It's the gathering of the geeks; Maker Faire is a celebration of the open hardware making and hacking culture, California style. There are smaller Maker Faire events around the world, but the two-day event in Silicon Valley is where you can hear from the founders of Arduino, astronauts and the veterans of personal computing history, such as Atari founder Nolan Bushnell. 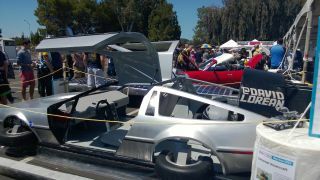 Cars at Maker Faire range from the exotic - the hovercraft built to look like a DeLorean and powered by a lawnmower motor - to the experimental - CalSol is a solar-powered electric car that looks like a cross between a landspeeder and a stealth bomber. Rather more practical was the BMW converted to run on electricity, with a 100 mile range. Electric Motor Werks did the conversion, and it's also come up with two charging stations, both built with Arduino hardware. The 12kw EMW SmartCharge 12000 charges a car in three hours, and the lower-powered EMW JuiceBox will be available as a Kickstarter project. If you want to put your own designs on clothing, Lumi is a new kind of fabric dye that develops in sunlight like a photograph - but unlike photographic chemicals, they're not dangerous to have around, and unlike silkscreen printing you don't need to cut out a stencil. You spread the dye - which comes in several colours - onto the fabric then put a negative of your design on top and leave it in bright light for 30 minutes. Once it's exposed, you wash off the dye and you have a permanent print. In a couple of weeks, Lumi will have an iPhone app that converts your photos to negatives and sends them to Lumi to print on a sheet of acetate that you can reuse to print as many witty T shirts as you want. If you want to put a tiny satellite in orbit, you can do it - for a few weeks at least. KickSat and NanoSatisfi ArduSat are projects that enable you to design a very small satellite and have it sent into space on one of the SpaceX flights that takes supplies to the International Space Station. The satellite will drop out of orbit and burn up in the atmosphere after a month or so, but until then they'll run the experiments you've designed. ArduSats have gyros to stabilise them, and high resolution cameras, but you only get a share of the mission time - anywhere from three days to two weeks. Only 30% of what a candle radiates is light; 70% of the energy is wasted as heat. We already love the $69 tPOD1, a giant heat sink that sits over a candle and uses it to power an LED light that's much brighter than the tea light itself (using the Peltier effect). At Maker Faire, Biolite showed off a $130 camping stove that burns twigs and charges your phone at the same time. It converts some of the heat from the fire into electricity that drives a fan that makes the fire more efficient - and puts out 5V of 2W power from the USB port on the side. And you can still boil water and roast marshmallows on it.